Ed. note: Paul O’Rourke reviews the top 5 (okay, he picked 6) movies he screened at this year’s Telluride Film Festival. There’s not enough space to adequately convey the many great things that took place during this year’s Telluride Film Festival. The festival’s co-directors Tom Luddy and Julie Huntsinger deserve high praise. The films I saw, the actors and directors I had the good fortune to interact with, and the way in which the festival itself was choreographed (a well balanced schedule of films with Q & As on Sunday and Monday) left me with nothing but good feelings and good things to say. As reported in the previous dispatch, there are simply too many good films and not enough time to see them all. But now that I’ve seen everything I could possibly fit into four days, I’m confronted with the question that all festival attendees face: what was your favorite film? And no, “they were all my favorites” won’t fly. You’ve got to pick one, or at least offer your top three, five at the most. But before I jump off that journalistic cliff, a few of the several films that didn’t fit into my top five deserve special mention. I’ve mentioned Downsizing; it’s a great film, funny, and thought provoking all at once. Film Stars Don’t Die in Liverpool is a wonderful platform for Annette Bening to showcase her considerable talents. The Cotton Club Encore is noteworthy for Francis Ford Coppola keeping his promise to himself to remake his 1984 film into the version he’d originally intended. The Battle of the Sexes, the much talked about film reenacting the 1973 tennis match between and the personal lives of Billie Jean King and Bobby Riggs will be seen by large audiences. Emma Stone and Steve Carell were excellent. And for those films I didn’t get the chance to see—I won’t list the entire festival lineup—I have every intention of viewing them some day soon. Had I been able to see them during the festival, who knows, my top five may have been configured in a different way. 5. Wait. I’ve already changed my mind. I’ve got six. We’ll call it 5a. Foxtrot has to be on my list. On day one, at the press/patron screening of Downsizing, a white-haired gentleman chose the seat next to mine. His face looked familiar. I scoured through the festival newspaper. I looked his way as I pointed to the photograph, his photograph. He nodded. He is Katriel Schory, the man who almost single-handedly over the past 16 years and through the Israeli Film Fund has built and boosted Israel’s cinematic presence in the world by leaps and bounds. And in championing courageous films by directors of diverse backgrounds and beliefs—both cultural and political—he’s helped to not only raise awareness for Israeli films but also a few eyebrows. Katriel has more than once come into conflict with his country’s increasingly right of center stance on most things, including filmmaking. He mentioned that one of the reasons he wanted to come to Telluride was to view the Iranian film, A Man of Integrity, a film he said, for political reasons, would probably never be seen in Israel. And it will perhaps be the same for Foxtrot. Directed by Samuel Maoz Foxtrot (winner of three awards at the Venice Film Festival) is so much more than a commentary on the moral and personal tragedies of war. It is a film about gut-wrenching grief and about personal secrets and about the consequences of past actions that can occupy our minds and guide our consciousness. We hope Foxtrot is seen in Israel. We hope it’s seen everywhere. Foxtrot is that powerful. Lady Bird is fun; it’s feel-good, and it makes us ponder our own coming-of-age story. It has just about everything that makes for a good film. I reviewed this film in my first dispatch, so I won’t repeat myself. But after further contemplation I’ve grown even more fond of this very well directed movie than I was after first viewing it. It’s clean and light, meaning it takes us in and through the complex and intimate stories of two people, a mother and a daughter, without burdening us with what could have been a trite and therefore unfulfilling story about a mother-daughter relationship. And for that navigation through Lady Bird’s senior year of high school credit is due to Director Greta Gerwig. I saw and felt her presence in the film. Her acting instincts, finely displayed in Francis Ha (screened in Telluride in 2012) transitioned well in her directorial debut. Lady Bird will make any audience happy; it flies very well, indeed. A Fantastic Woman is, well, fantastic. It won three awards at the Berlin International Film Festival. And like Lady Bird, after further review and another conversation with the Director, Sebastian Lelio I appreciate the film even more than I did after I first saw it. The art of casting cannot be overstated. Finding the person to portray Marina was the result of a sort of search and discover mission. Everywhere he went in Santiago during his efforts to locate the perfect actor for the role, Lelio was told to make sure he spoke to Daniela Vega. And when he found her what he discovered instructed him instantly on what his film was to become. The strength of Daniela, to be who she is in real life, is what made Daniela as Marina a character so engaging, so endearing, and such a fantastic woman. Director Guillermo Del Toro (Pan’s Labyrinth, The Devil’s Backbone) likes fairy tales and he likes monsters. And he particularly likes it when the beast prevails. Del Toro was disappointed in Beauty and the Beast, only because in order for the beast to have his beauty he had to become human again, lamenting that the film seemed to imply the beast would not have otherwise had a chance with Belle. Del Toro has a special place in his heart for the creature from the black lagoon. “It broke my heart,” he said during a post-screening gathering at the Sheridan Bar, “to see that monster walk into the swamp, defeated and forlorn.” That particular monster was a partial inspiration for Del Toro’s new film The Shape of Water. This film is indeed a monster story—there are actually two monsters, an amphibian-man monster and a truly bad monster, a male American government agent—and it’s a love story, a real love story. The viewer senses that the female (Sally Hawkins) and the fish-man are destined to be together as soon as their eyes first meet. Isn’t that how love is supposed to be in the movies? And the title is important. In an interview with his friend, Alejandro Gonzalez Inarritu, Del Toro explains, “It’s called The Shape of Water because love has no shape. Love has the shape of the recipient that takes it in. Same with water.” There is a lot of water—and love—in this film, along with a great deal of creative imagination—including a song and dance number between the beauty and the beast. The Shape of Water proves that love does conquer all. The film is the perfect antidote for our time. 2. Darkest Hour is, at once, a cinematic revision of what and who we think Winston Churchill was. Often remembered as a grumbling, grouchy, cigar smoking, whiskey swilling and warmongering leader of the conservative party in Great Britain at the outset of the Second World War, Churchill in Darkest Hour is at various moments loveable and endearing and sentimental. The film succeeds, however, because of Gary Oldham’s extraordinary performance. As Winnie, Oldham rages, despairs, orates eloquently, and in one scene chortles uncontrollably when informed that the backhanded “V” he provided press photographers was not the victory symbol he’d intended it to be and later perfected, but a gesture conveying “up your bum” to everyone who saw it in the newspapers. It’s a role, like Sid Vicious in Sid and Nancy and Beethoven in Immortal Beloved that is perfectly suited to Oldham’s genius, one that is sure to catch the attention of the Academy members when Oscars are considered. Just see it. 1. 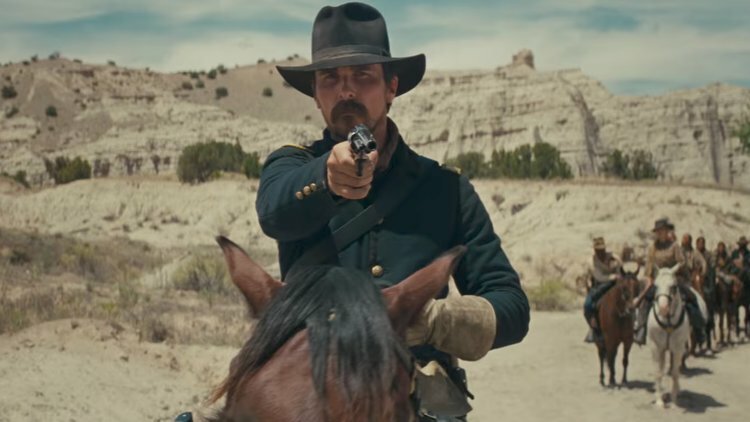 Hostiles literally took my breath away. In trying to describe the ending to my wife, I broke down. It took several minutes to regain my composure. And I have to think that is exactly what Director Scott Cooper had in mind for me, and for the many who did and will see this superb film. Captain Joe Blocker (Christian Bale) is a grizzled twenty-year veteran of the wars to rid the American West of its native inhabitants. He becomes the personification of a long and painful road to redemption. The actual journey takes place in 1892 and involves the close-minded strong-willed captain (Bale) as he escorts his arch enemy, a dying Cheyenne chief (Wes Studi), as they make their way from an army encampment in New Mexico to the chief’s tribal home in Montana. He’s been granted a clemency, of sorts, allowed to go home with his immediate family to die. The troop encounters the lone survivor (Rosamund Pike) of a horrific slaughter of a white family by renegade Comanche. The scene only confirms Blocker’s conviction, mirroring as it does the prevailing attitude intoned by U.S. Army General Philip Sheridan, “the only good Indian is a dead Indian.” The cinematography (Masanobu Takayanagi) expertly captures the rugged terrain, at times at elevations above 12,000 feet, and the often-inclement weather, rendering the journey even more arduous and dangerous. What Captain Blocker and the chief encounter and endure on the long and winding trail is as challenging as it is transforming. And when at long last the protagonists arrive at their destination a final set of obstacles presents Blocker with the ultimate test of his will and personal convictions. The outcome, as exemplified in that final scene, will take your breath away.